STARKE, Fla. — A Kentucky National Guard disaster-response unit successfully completed four days of evaluations at Camp Blanding Joint Training Center here Jan. 15, demonstrating to inspectors that the cadre of Army and Air Guardsmen is fully mission-capable. The unit — called the Chemical, Biological, Radiological, Nuclear and high-yield Explosives Enhanced Response Force Package, or CERFP — offers unique capabilities designed to assist civilian authorities in the event of a disaster or attack, explained Army Lt. Col. Lance Grebe, commander of the Kentucky CERFP’s 103rd Chemical Battalion. More than 200 Kentucky Army and Air National Guard members participated in the exercise, called Operation Starke Thunder and staged at the Joint Inter-Agency Training and Education Center. The inspection team was made up of Army and Air Guard members from around the country with expertise in each area of CERFP operations. 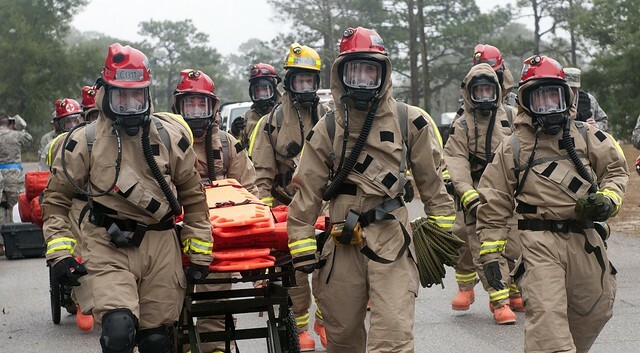 The evaluation got underway when the CERFP was given a disaster scenario requiring members to plan and implement a search-and-rescue effort, recover casualties, and provide decontamination and medical treatment for victims. The CERFP’s six elements moved into a designated area and divided assets into a hot zone and cold zone, with the fictional disaster site being at the apex of the hot zone, Grebe said. A command-and-control center was set up at the base of the cold zone, as was a Joint Incident Site Communications Capability, which provided secure communications for the operation. A Search and Extraction Team, outfitted with chemical safety gear, then pushed into the contaminated hot zone to locate survivors. Team members assessed any injuries, wrote the information on a tag and sent the survivors through a mass-decontamination station that was set up between the hot and cold zones. After decontamination, the survivors were given further triage and medical care by CERFP clinicians. While the survivors were being cared for, a Fatality Search and Recovery Team went into the hot zone in protective gear to retrieve fatalities. During the first three days of the exercise, CERFP members reported to the site, received the scenario, set up their respective elements and performed their respective tasks with members of the JITEC inspection team providing oversight and guidance. On the final day of the exercise, the same activity was repeated while inspectors evaluated the operation with the intent of certifying the Guardsmen to fulfill the CERFP mission of providing immediate response capability in the event of a disaster. 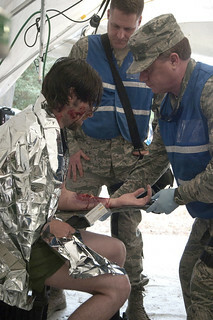 The Kentucky CERFP, which stood up in 2010, is comprised of more than 150 Army National Guard Soldiers and 47 Air National Guard Airmen, according to Air Force Lt. Col. Christopher Howell, officer in charge of the CERFP medical element. “The CERFP is a purple team,” Howell explained. “The Air Guard personnel are responsible for the medical component, 10 members of the Search and Extraction Team, fatality recovery and communications. The Kentucky Airmen are members of the 123rd Airlift Wing, based in Louisville. The Kentucky Army Guard personnel come from the 103rd Chemical Battalion and the 299th Chemical Company, both based in Maysville; and the 301st Chemical Company in Morehead.